HSU Jacks and their mascot Lucky pose with reusable cups. The rallying cry is "Kill the Cup!" and Humboldt State University students are killing it, literally and metaphorically. The national waste reduction program includes an annual University Challenge which measures how many drinks are served to students in reusable cups at participating coffee shops. Last year's winner, Miami University, measured 5.52 percent participation by students. So how does HSU, one of 16 schools competing nationwide, measure up? "We were at 35 percent by the second week," says Shohei Morita, education director of HSU's Waste Reduction and Resource Awareness Program (WRRAP). Friday was the final day of the competition, and WRRAP spokesperson Meredith Garrett says they are "very confident" of their chances. Results will be announced Dec. 1, and the winning university will earn $5,000 toward the sustainability project of its choice. WRRAP's endeavors include tabling at the quad, offering reusable cups and free smoothies from a bicycle-powered blender. 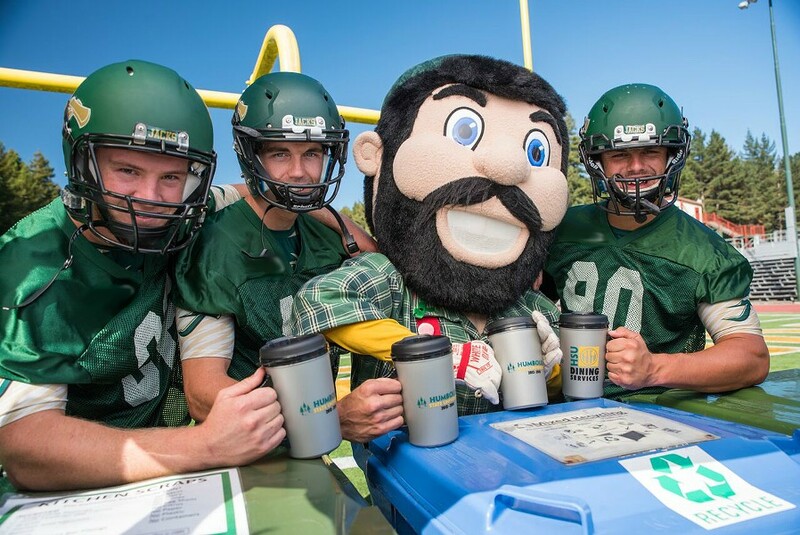 The HSU Lumberjacks football team also got involved, working with WRRAP to encourage a "zero waste" game day, where attendees received reusable cups and volunteers stood by to encourage recycling and composting. Students were also encouraged to upload photos of themselves with reusable cups to Facebook to boost their chances of winning. Morgan King, sustainability and waste coordinator at HSU, says that historically waste reduction on campus has been a "bottom up" effort, with students leading the charge to create a campus recycling program in the 1980s. Since then, the program has been integrated into facilities management and the push to reduce waste has "come from the top" as well. President Lisa Rossbacher, appointed in 2014, has prioritized efforts to create a greener campus, says King. "It's actually a really exciting time right now," he says. "We continue to see a decline in waste even though we have increased enrollment."